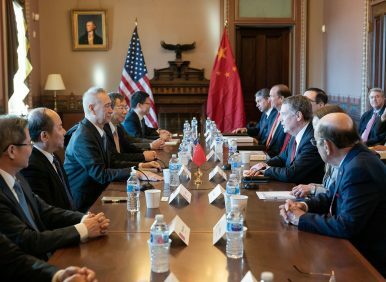 A photo of earlier U.S.-China trade negotiations in Washington, D.C.
U.S. trade negotiators arrived in Beijing on Thursday to start a new round of talks aimed at ending a tariff war over China’s technology ambitions as officials hint they might be making progress. President Donald Trump expressed optimism last week, saying, “We’re getting very close.” The chief U.S. envoy, Trade Representative Robert Lighthizer, said this week that questions about details and enforcement remain to be answered. Neither side has indicated they are making progress on the core of the dispute: U.S. pressure on Beijing to drop industrial strategies that China’s trading partners say violate its market-opening obligations and might be based on stealing technology. By Joe McDonald for The Associated Press. AP producer Fu Ting and AP cameraman Wong Wai-bor contributed to this report.